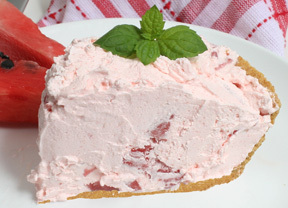 FEATURED RECIPE: EASY, CREAMY WATERMELON PIE - What About Watermelon? Being a guy, my culinary skills have certain limitations. I know, I know, there are lots of guys out there who are great cooks, so I really have no excuse, but at least I’m willing to admit my weaknesses. Which is why, when I saw the word “easy” in the name of this recipe, I had to put that claim to the test. Actually, it’s my personal goal to try out most of the recipes featured here on What About Watermelon before I post them. This trial serves several purposes. First, it allows me to take photos of the finished product (they might not always be pretty). It also allows me to report on taste and make any suggestions to the recipe or directions. I can’t promise that I’ll test them all beforehand, but I’ll try many of them. Back to the “Easy Creamy Watermelon Pie.” I’m happy to report that this recipe lived up to its title by being both easy and creamy. I would also suggest adding the word “delicious” to the name. I forgot to take a picture, so the photo you see above is a shot I found of something similar (so don’t be alarmed if your attempt doesn’t look like that). Combine gelatin and boiling water in bowl. Stir until gelatin is dissolved. Allow mixture to cool to room temperature (to speed up the process, put it in the fridge for about 10 minutes, but don’t leave it in there too long or the mixture will harden). Whisk in whipped cream. Fold in watermelon cubes. Spoon mixture into crust. Chill for three hours or overnight and enjoy! This looks awesome, can’t wait to try it! I hope it holds up with the fat free whip cream. It should hold up with the fat free stuff. I use fat free whipped cream in a lot of recipes and it seems to perform just as well as the regular whipped cream. At least for me. If you try this recipe, let me know what you think of it!